Sarah our Green Guardians Project Officer talks about her Easter adventures in bushcraft. Green Guardians is all about getting young people outside to make connections to nature. Bushcraft can be a great way to do this. There’s something about spending time in the woods and sitting round a fire fettling that really brings people together. Sorting sticks for the first bushcraft challenge! 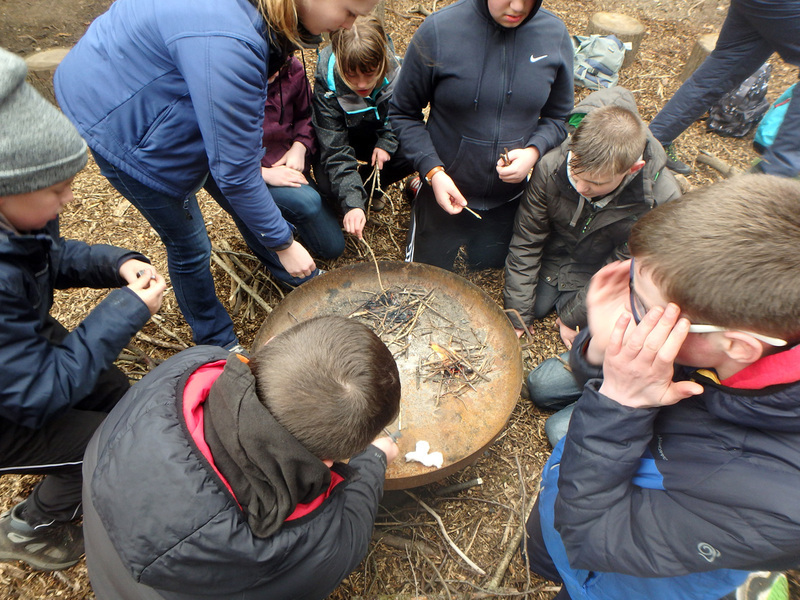 I had a great couple of days out in the first week of the Easter holidays with two youth groups – Oxenhope Youth and Skipton Young Carers doing bushcraft activities. We were based up at Malham Tarn Field Centre and whilst the weather was somewhat bleak, spirits were high. Each day began with an orienteering type quiz to collect items needed for the bushcraft session. This gave the young people time to explore the beautiful location on their own. They also found out a bit about what goes on at Malham Tarn and how the Field Studies Council work to benefit the environment. Bushcraft began! Not surprisingly we started by collecting a lot of sticks and sorted them into size order, followed by a demonstration on how to light a fire without matches. The young people were then challenged to light their own fires. Given the rather wet weather, this was a pretty tricky task! 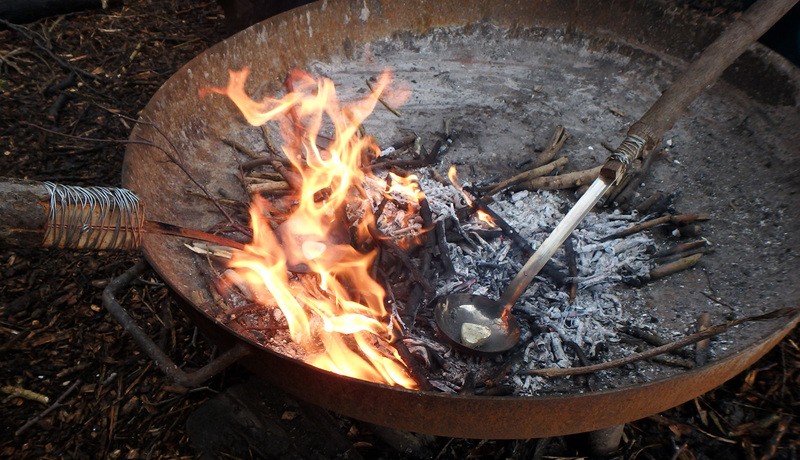 But both groups succeeded without help and we made hot chocolate on the Kelly kettle to celebrate & warm up. Success in the fire lighting challenge! I’d designed the rest of the session to be quite informal with craft activities they could try on and round the fire. Some of the group decided they’d like to do some den building – which was great. When I work with young people I’m really keen to let them follow their own interests as much as possible. So long as it’s safe is my motto! Our favourite activity was pewter casting which produced some lovely results that the young people could take home. 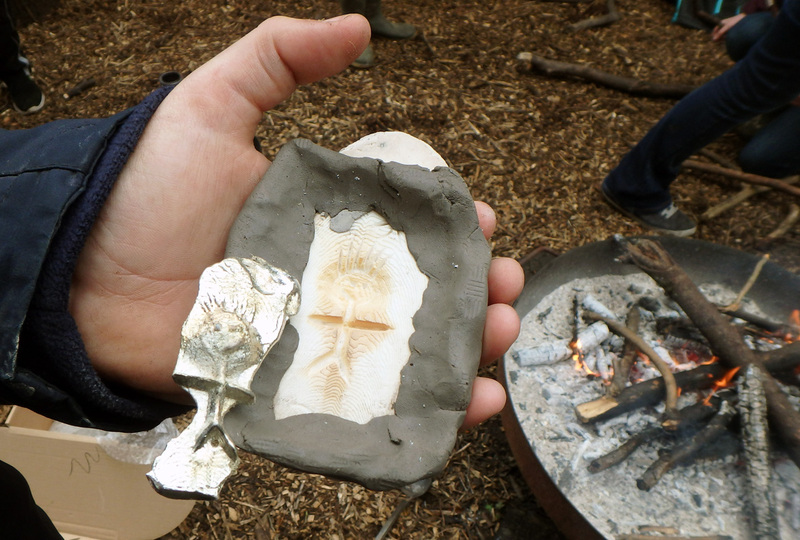 Pewter casting – our favourite fireside craft activity. The day concluded with a bit of reflection around the fire – with toasted marshmallows of course! Big thanks to all the young people for their enthusiasm and to the support staff who came along and to Malham Tarn Field Centre for letting us use their grounds (and come inside for lunch on the coldest day!). Green Guardians is part of the YDMT’s Green Futures programme part of Our Bright Future, a £33 million programme funded by the Big Lottery Fund and run by a consortium of eight organisations which is led by The Wildlife Trusts. To find out more about Green Guardians visit our website.